I fully expect DISARONNO to book me for some exotic getaway any day now. Seriously, Kyle! Anyway, coming off my Day in Capri cocktail, I decided to try what they seem to be suggesting as a "diet" cocktail. I mean, really? "Beach Ready"? Is that because they call for Splenda as an ingredient? LOLOLzzzzzzzzzz. 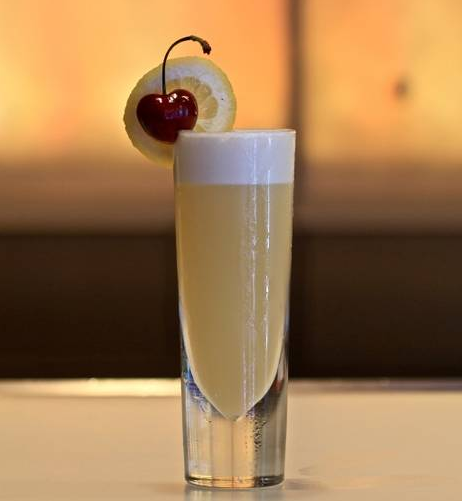 DISARONNO Skinny Sour is designed to make you think you're on a beach in St. Bart's. Since I live in Florida, that is probably a fairly simple mind game. But I'm here to help you take this trip for yourself, cocktail in hand. I tripled up on this recipe since my previous cocktail was a little short on volume. My wife thought it was the same as the Day in Capri cocktail I made for her a month ago. Though I disagreed with her (not enough to be stupid, though), I certainly see just how powerful the flavors of the DISARONNO are. Add in the same lemon juice, and compare the simple syrup with the Splenda and yeah. Anyway, another really good cocktail to try out. Note: I garnished with a strawberry, then let that strawberry float in my drink along with a lemon slice garnish these guys showed in their photo (see below). Which picture is better? Yeah, I know! Combine all ingredients. Splash of club soda to top, then garnish with a cherry. St. Bart’s synthesizes French, West Indian, Creole, Italian and Asian influences to produce the most alluring, lavish and diverse travel destination. Prepare to dabble in the arts, music, festivals and holidays – DISARONNO’s simple and skinny choice keeps you beach-ready and in top shape year-round.